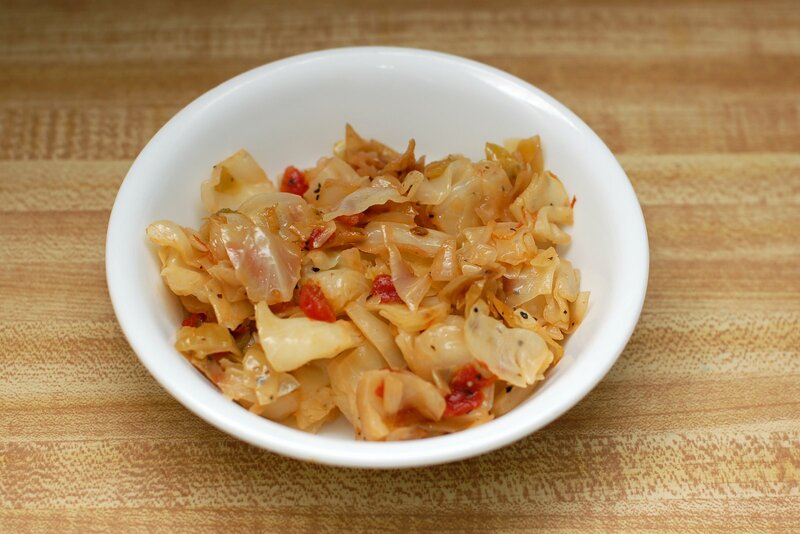 This recipe is like the cabbage they make at a restaurant called Luby's here in Texas. They way they make it there, however, is not even remotely vegan. Boil cabbage for about 4-5 minutes in a large pot, just until tender. Drain. In a large skillet, heat Earth Balance and saute tomatoes with the spices for several minutes. Add drained cabbage, keep cooking and stir occasionally until the cabbage is done to your liking. Garnish with fake bacon if desired. Recipe notes: Use a can of Ro*tel tomatoes for some extra spice or add 1/2 teaspoon of crushed red pepper flakes. Mmm. 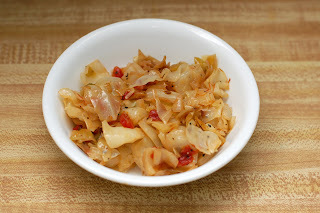 I don't think you can ever go wrong with fried cabbage, and this recipe sounds awesome.